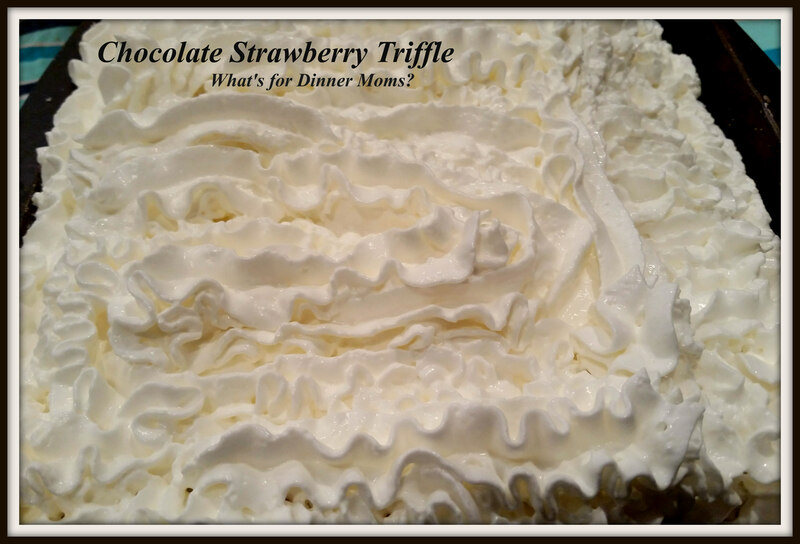 Chocolate Strawberry Trifle – What's for Dinner Moms? This is a great dessert that is so easy and light for Spring and Summer. The sunsets lately have been so beautiful. You can feel the weather changing so quickly. I know we are looking forward to fresh fruits and vegetables. The great thing about this is you can use whatever berries that are in season and change to the pudding mix to make so many different combinations. It looks particularly lovely in a trifle dish. I need to get a new one because since we moved I have been unable to find mine. They are great things to have not only for this cake but fruit salads and regular salads too! Normally a trifle has cake pieces soaked in wine or sherry but I was serving this to my family. A little bit of red wine drizzled over the cake sections would have added great flavor to this. If you are making one for yourself you may wish to choose a wine or sherry that would pair well with the pudding and berries you have chosen. This was delicious! I wish I had a trifle bowl so you could have seen the layers and how pretty it looks. It looks pretty but it doesn’t hold slices when it is cut if you plan on serving it from a pan as I did. It is to be scooped up and put in a small bowl. Don’t worry about slicing it. Layer the cake, pudding, strawberries and top with remaining cake in your bowl. Cover with whipped cream to the edges. They are a delicious combination! I’ve got to find my trifle dish. I had forgotten how much I love trifles and this one looks delicious! Oh my goodness! OH MY Goodness! YUM overload!! Did I say Oh My Goodness!?? lol! I can taste it from here! Please follow my blog if you are interested in Indian home food recipes. Thanks. Thank you! Following you now!